For Chicago Mayor Rahm Emanuel, A Mixed Midterm Report Card Not only are Chicago's schools troubled, the city's homicide rate spiked last year to its highest point in 10 years. Unemployment is 9 percent. And the city's deficit is looming near the $1 billion mark. That's just the short list of urgent problems facing Chicago Mayor Rahm Emanuel. Former White House Chief of Staff Rahm Emanuel speaks at his election night party on Feb. 22, 2011, in Chicago. As mayor of Chicago, Emanuel has faced major challenges, ranging from a ballooning deficit to education, the economy and crime. A little more than two years ago, Chicago's then-mayor-elect, Rahm Emanuel, expressed his gratitude to supporters on election night. "Thank you Chicago, for this humbling victory," he told the crowd. "You sure know how to make a guy feel at home." But today, Emanuel faces sobering challenges common to most of American's biggest cities. Not only are schools troubled, Chicago's homicide rate spiked last year — a total of 516 murders — the highest in 10 years. Unemployment is 9 percent. And the city's deficit is looming near the $1 billion mark. And that's just the short list of urgent problems. Emanuel ran for mayor as a hometown boy, but he was never a part of the political dynasties that have defined Chicago. He'd left his position as White House chief of staff to govern a city controlled for more than 50 years by the Daley family. Richard J. Daley took office in 1955 and passed the power to a few Democratic protégés. Then his son, Richard M. Daley, served six terms before stepping aside in 2011. The Daley dynasty was, ostensibly, over. 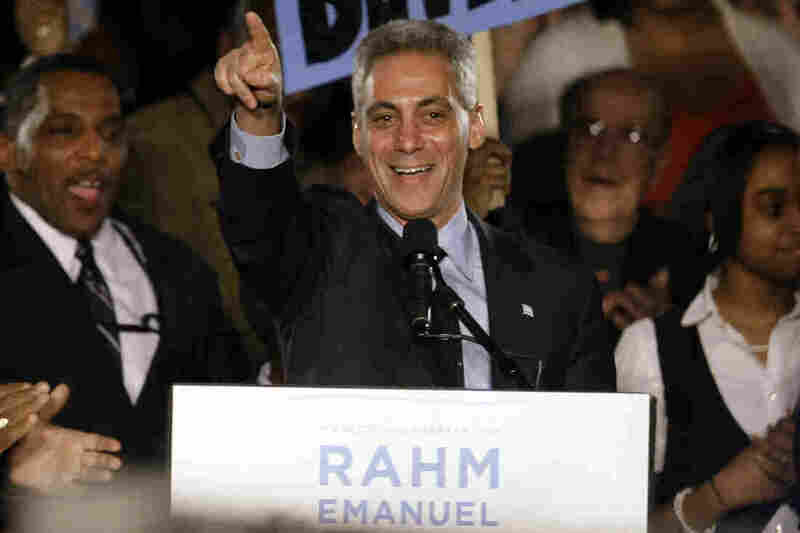 "And let's be honest, it's an impossible act to follow," Emanuel said on election night. "Yet, we have to move forward. And we know that we face serious new challenges." Emanuel's new-guard Democratic credentials were solid: The three-term congressman had served five years as an adviser to the president in the Clinton White House, and then spent two years with President Obama as his chief of staff. John Kass has been a reporter and columnist at the Chicago Tribune for more than 20 years. No fan of the Daleys, Kass has his doubts about Emanuel, who he says is more a creature of his Washington years than a genuine Chicagoan. Members of the Chicago Teachers Union, parents, students and other opponents of a plan to close scores of Chicago public schools march through downtown Chicago in March. 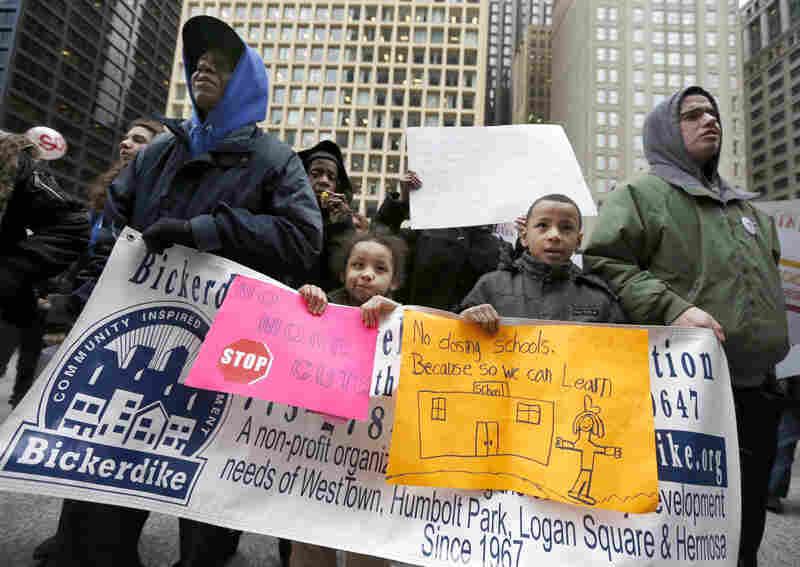 In the end, the city closed 50 schools, mostly in low-income communities. "He's trying to offer leadership in a very difficult situation," Kass says. "But he's actually more an operative than a manager. His problem is he's his own chief of staff. He's his own press secretary. You know, he's a control freak that way. He's just got to ... step back a little bit." But, Kass concedes that Emanuel inherited a very troubled city, one that's running out of money. "So in some sense Rahm is kind of like those lumberjacks that are on a log," he says. "They're rolling their feet ... to stay dry, because if you stop tapping, you'll fall in." And, Kass says, part of what Emanuel inherited is a seemingly indestructible Democratic Party infrastructure that has outlasted the Daley dynasty, and still provides the framework for how Chicago works — or doesn't. "This is a Democratic, blue state with Democratic bosses basically controlling it," Kass says. The Daley family controlled the city for half a century, while the Illinois state speaker of the House, Michael Madigan, has controlled the state legislature for about 30 years. "They're both South Side Irish guys who know how to play," Kass says. Kass says appreciating the context for Chicago's problems is critical, and the real story is often missed. He says the murder of 15-year-old high school student Hadiya Pendleton in January hit the already suffering city like a cruel insult. The South Side teenager was shot to death while standing with friends in a park. Two weeks earlier, Pendleton performed at Obama's second inauguration. The president spoke about Pendleton when he gave his State of the Union Address in February, two weeks after she was shot to death; the first lady, Michelle Obama, attended Pendleton's funeral in Chicago. "She was what I called the perfect victim — young, innocent, people identified with her. She became symbolic," Kass says. "Unfortunately, in Chicago, there are what I call imperfect victims. ... Every day there are kids like Nazia Banks and other little young boys that I've written about and he falls through the media cracks, he's not beloved or made into an icon for political purposes. He's just forgotten." The real story of Chicago is nuanced — and evaluations of the mayor's tenure vary accordingly. Laura Washington, a longtime Chicago political analyst and Chicago Sun-Times columnist, says people ask her all the time how the Emanuel administration is doing so far. 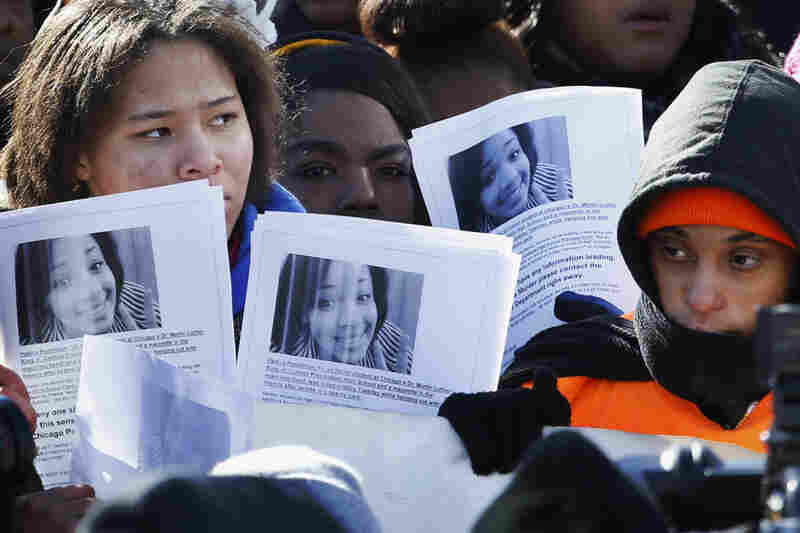 Protesters at an anti-gun violence rally in Chicago in February hold up photos of 15-year-old Hadiya Pendleton at the scene where she was killed Jan. 29. She was shot dead two weeks after she performed at President Obama's second inauguration. "My answer is, you have to ask how Chicago is doing and you have to decide which Chicago you want to ask," she tells NPR's Arun Rath. For instance, she says, downtown corporate power brokers are very happy with the city's direction. "But there's another Chicago, and that tends to be among communities of color, that feel their voices have not been heard," Washington says. Chicagoans appreciate Emanuel's trademark aggressive style, Washington says, but he's not a natural negotiator. "We love a good fight in Chicago, and we like to get down and dirty," Washington says. "I think that the problem is that he doesn't leave room for dissension, and he doesn't tolerate backtalk." A major controversy was his decision to close 50 schools to help balance the budget. "The schools were closed in areas that had lost significant population over the last 10 years ... most of them in communities of color, low-income communities," Washington says. "Folks representing those communities — from the teachers to the parents to the students — felt betrayed." The union issues haven't ended there: Washington says the mayor has picked fights with the police and firefighters unions. "He's perceived as being a very much pro-corporate, very much pro-privatization, so that has made folks, especially in the union community, very, very hostile to him," she says. Nonetheless, Washington says she thinks Chicagoans got what they expected — a tough, single-minded, controlling mayor — but they're disappointed that change hasn't come as quickly as they'd like. "The violence thing is very disturbing I think to a lot of folks, because there's no clear, obvious reasons why Chicago's violence feels so out of control," she says. The problems in Chicago are big enough and stubborn enough that some significant issues linger on the margins of the mayor's agenda. Lake Michigan and the Chicago River are polluted, and the city faces many energy and environmental justice issues. But shortly after Emanuel took office, he dismantled the city's Department of Environment, citing budget constraints. Some staffers were cut, while others were moved to different city departments. Henry Henderson, the Midwest director for the Natural Resources Defense Council, was Chicago's commissioner of the environment under Mayor Richard M. Daley from 1991 until 1998. Henderson says Emanuel doesn't see the environment as an organizing principle. "There is a problem of how it fits within a vision of the future of the city," Henderson says. "Clearly, fiscal responsibility, economic development, significant problems with schools and violence are pervasive. How to integrate energy, water quality, air quality within a central part of the initiatives of the city, remain questions." But the biggest question of all is whether Emanuel will try for a second term. With no significant challengers so far, he has reportedly already raised $5 million for a re-election campaign. That's a lot of money, but the election is still more than a year away, says Washington, the Chicago Sun-Times columnist. She expects him to triple that amount by election time in 2015. "I think he's looking really tough to beat right now," she says. Washington says the mixed results on the issues, and mixed reviews from Chicagoans, don't mean Emanuel can't win a second term — if he wants it. "One of the things that I think disturbs some voters here is that they feel that Rahm Emanuel's always got one foot in and one foot out," she says. "Some people think he has presidential aspirations, which he's denied repeatedly, but I think people are a little bit wary of whether he's going to be around for the long haul."